While TekMiss is a website and social media company, Kathy Rausch, the owner, also has a passion (more of an obsession really) with the mandala. She wrote and illustrated this book (and companion workbook) in 2015 and is happily working in both worlds of geekdom and creativity. To see more about the book, workshops and events, visit www.activatedivinecreativity.com. This book will drastically change your life and bring you back to your creative self. Back to who you really are. Read this book and follow the simple instructions to doodle your own mandala, and open doors to creative avenues that you may not even be aware of. You will find peace and serenity with a way to turn off the crazy amped up world we live in. Activate Divine Creativity is a story and workbook in one. It illustrates a woman’s journey of experiencing a dark night of the soul and finding her way out and into a bright shiny world through the power of the mandala, grace, love and community. This is a simple, fun read with follow along instructions on how to doodle your own mandalas. Weaved within the story is each step the process and encouragement to be creative in all aspects of your life. Kathy Rausch has brought symbolism and its use in self discovery to a new level. Mandala making is not only fun but a powerful tool for transformation. This book will bring a smile to your face and a new awareness of your heart and all its desires. One of my least favorite subjects in school was art. As a child, I liked to color, but I quickly learned that I wasn’t the best and never trusted myself to get it right. If you told me a year ago that I would be drawing mandalas, I would have said, ‘No way.’ I didn’t even know what a mandala was. 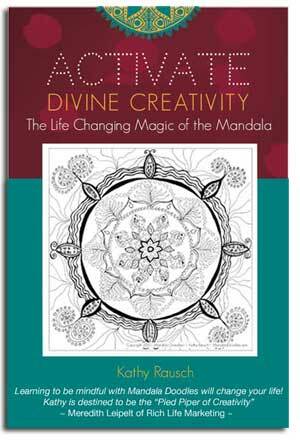 Kathy’s story is “real and true to her Spirit” of searching, understanding and bringing forward not only her natural artistic wonders but also her ability to teach others how, in a simple, methodical process, create a mandala while reaching into their soul. My first looked like a child made it. And yes, my inner child did create it at age 54. It unlocked a creative side of me that I had not experienced in a long time. This deceptively small book seems designed to open each of us up to our own, individual creativity. These simple, powerful prompts encourage even the most skeptical among us to get out of our own way and create our heart’s beauty. Grab a pen and paper and get ready to tune into your own elegance. You will be glad you did. ~ Diane Easley, Author “Create the Life You Want” and Chief Individualist at the Be YOU School.